I absolutely love disco balls, glitter and sequins, so it’s no surprise that New Year’s Eve is one of my FAVORITE parties to plan for. It’s the one time of year that you can dress up in glitzy glam from head to toe, and not seem like a weirdo. Last year, I left my New Year’s plans to the very last minute, and ran to my local dollar store to grab some items. While it came out really cute in the end, this year I wanted to plan it out a whole lot more. I wanted it to be PINK. And SHINY. AND DISCO BALLS. Gimme allllll the disco balls! And, since Christmas can be super pricey (goodbye, money!) I wanted this party to be affordable. So, I ran around my house and collected a few items, while also investing in some pieces I can use again and again. I have to say I’m really happy with the results. Can I live in this party permanently?! Since this party has a whoooole lot of stuff going on, I wanted to make it easy to get a list of all the supplies. It's all here in this excel sheet, right down to the confetti! You'll know exactly what I used and how much to order, in case you want to re-create the party, or to purchase a specific item. It'll come straight to your inbox in just minutes! The printable is available in my resource library, which you can get totally FREE access to, just by signing up. What exactly do you get? 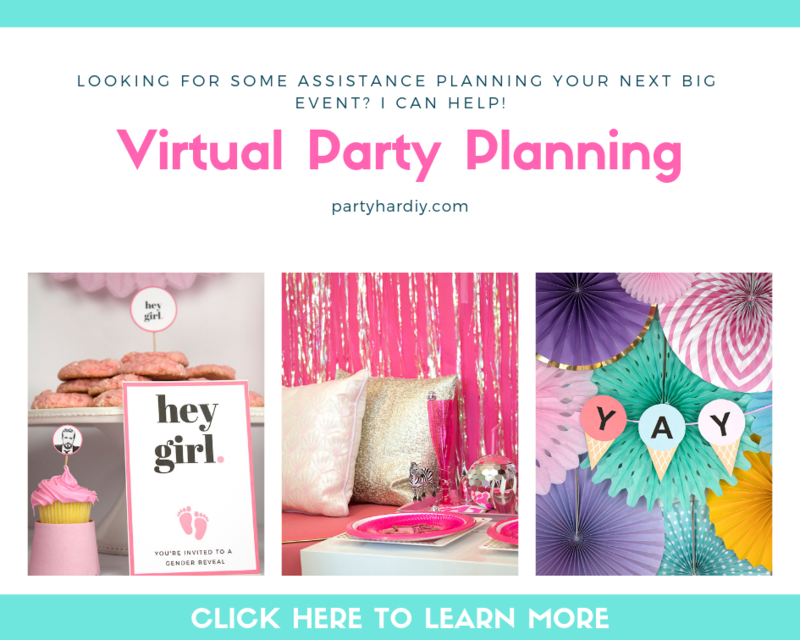 Access to all my printables, including party planning guides, checklists, and my projects. By signing up, you'll have access to all projects- past, present and future! To dress up your party, opt for an elegant white tablecloth instead of the usual plastic ones. This one is made of polyester and resists stains, so it’s perfect for popping it in the washer after the party is done! It’s also affordable too, just in case you end up with stubborn stains that just won’t come out. 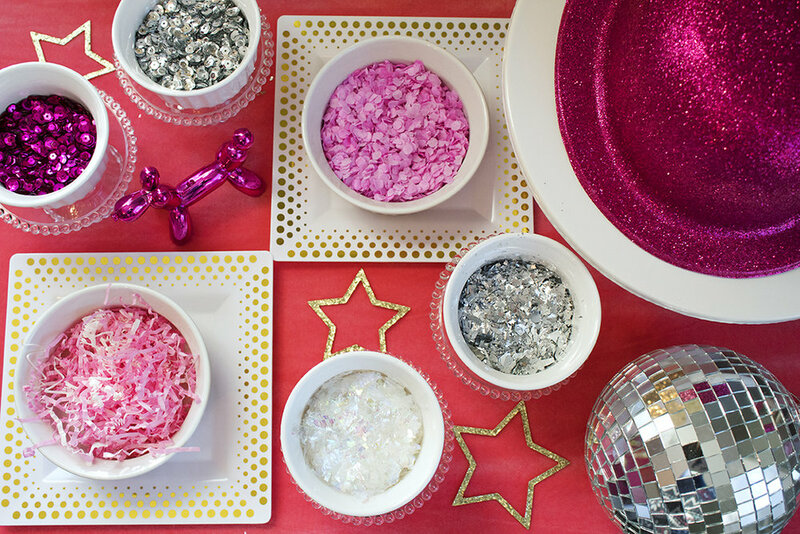 Every New Year's Eve party needs as much sparkle as possible! These glasses are dressed up with some basic and inexpensive star wire, and I think they’re so worth it! 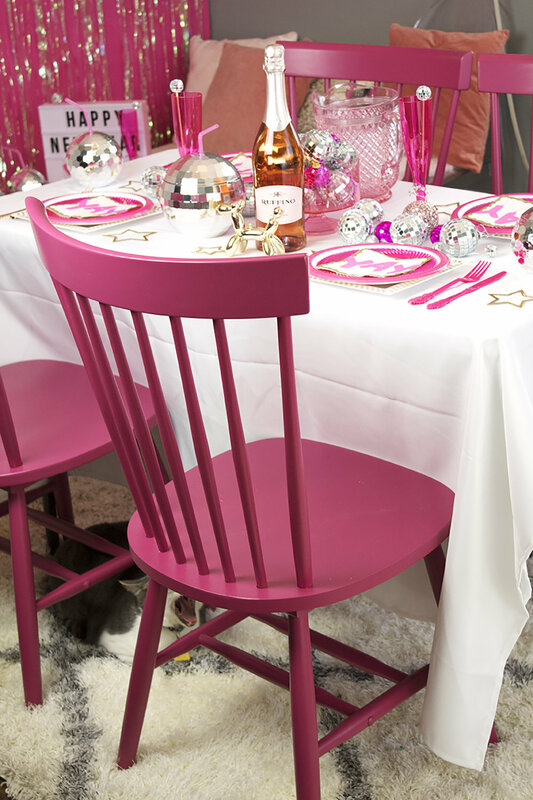 Because pink + tinsel + champagne = perfection. Top them with a disco ball stirrer and you’re in business, baby! For a fun party favor your guests are sure to love, grab a pack of disco ball cups! I have one I got on a Carnival cruise a few years back and I use it at almost every party I throw. It's the BEST for using on New Year's Eve! 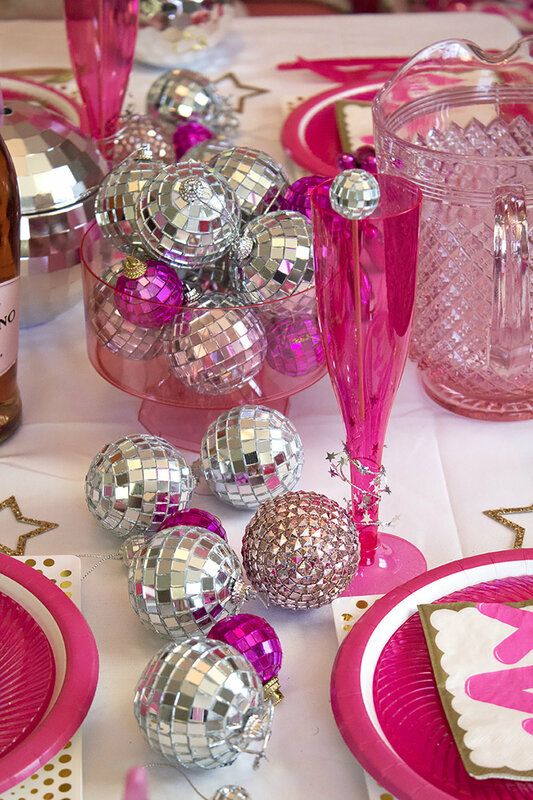 For the table setup, I grabbed a bunch of white and pink items, and created a disco ball table runner! It was super easy, since all I had to do was scatter some disco balls down the center. I also set up a bar in the corner to hold all our supplies. 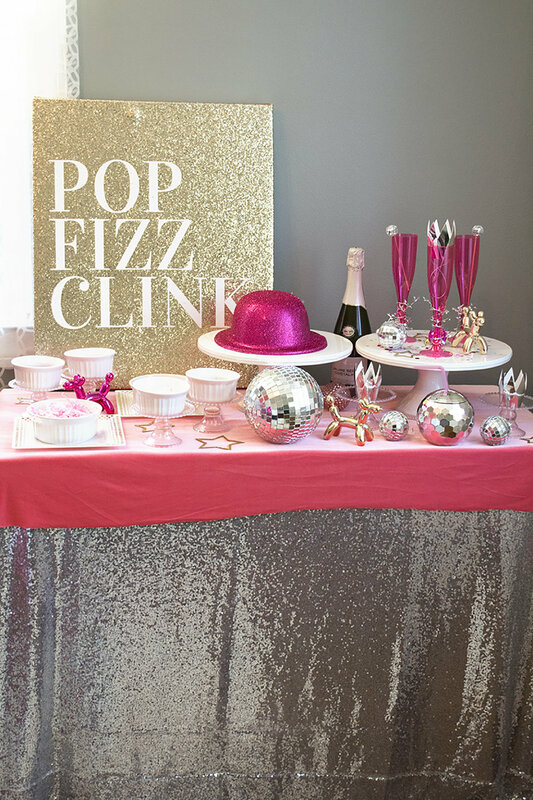 It acted as both a champagne bar and a confetti bar! All I had in this corner was a black desk, so I covered it up with a giant silver sequin tablecloth and some pink velvet to match the theme. I also wanted to create a little "lounge" area, so I gathered some ottomans and pillows to make it comfy. I set everything up in the corner, and added a small table for everyone to set their drinks on. My zebra tray was the perfect addition. This little lounge didn't cost any money and looked super cute! These balloon animal dogs got to make their debut once again. They make me so happy. While we were ready to party the night away, Roger snuck in and explored before having a rest under the table. Maybe he was impersonating the zebra so he wouldn't be seen?! Woohoo! And just like that, another year came and went. It's past New Year's Eve now, but if you're itching to have this party, I think it would make a great birthday party, bachelorette party, or even a Valentine's Day party! Be sure to request the excel sheet now, so you can get the full list of supplies in a handy excel sheet! If you're anything like me you've left gift wrapping (and shopping!) to the last minute. Well, don't you worry- I've got just the thing for you! 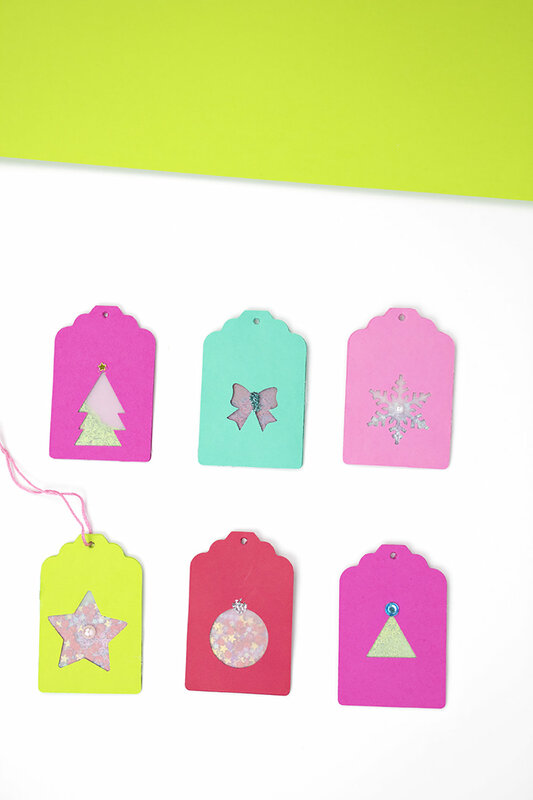 These gift tags are so easy to make, and they're fun and interactive! They're colorful, adorable, and festive! You can find the full directions on Giggles Galore. So head over to Giggles Galore, grab your supplies, pop on a Christmas movie, and let's start making them!